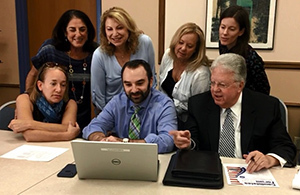 As the Tuesday, November 6 election date draws closer, prospective voters are once again invited to hear candidates for office at the biennial Candidates Forum co-sponsored by Temple Beth El of Boca Raton and the Jewish Community Relations Council (JCRC) of the Jewish Federation of South Palm Beach County. On October 28, 2018, beginning at 7:00 pm at Temple Beth El’s Schaefer Family Campus, community members interested in knowing the issues, choosing our leaders and making an impact with their informed votes will hear from candidates in person. The temple’s Schaefer Family Campus is located at 333 SW 4th Avenue, Boca Raton. Candidates for Florida Governor and elected Cabinet positions, as well as the U.S. Senate and House of Representatives, Florida Senate and House, and Palm Beach County Commission have been invited to attend and respond to questions prepared for each office. In addition, written material explaining the ballot amendments will be available. The Facebook event page will be updated as candidates commit to participate in the Forum. Doors will open at 6:30 pm. The Candidates Forum is free and open to the public. The event will also be live-streamed on the temple’s website. For more information, contact Temple Beth El of Boca Raton at 561-391-8900. The sponsors of this Candidates Forum are 501(c)(3) non-profit organizations. As such, they neither support nor oppose any candidate for political office.